It's day three of my Shopstyle outfit challenge series and I went with a upscale-meets-seasonal downtown look. For me it's the little things that make this outfit. For instance the inappropriately summer-ish denim vest peeking out of the overcoat, the popped collar, and how the panels on my leggings meet the panels on my boots. 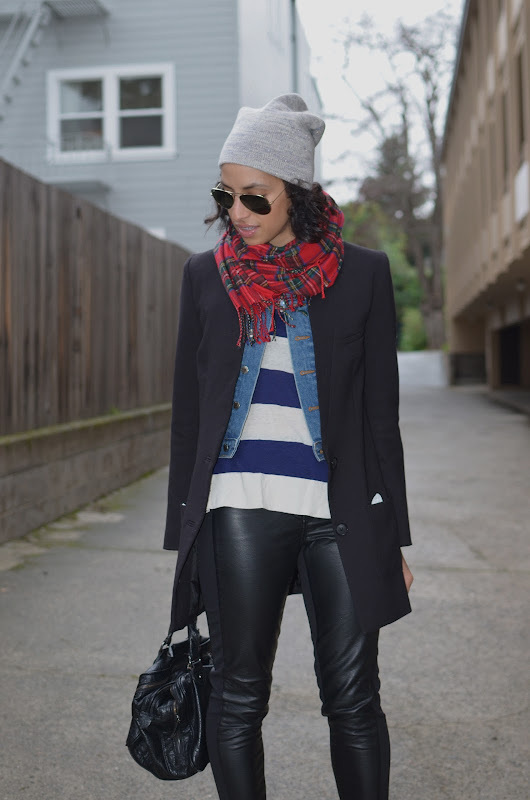 Not to mention the beanie, my favorite seasonal scarf and switching out my sunglasses- love those Ray-Bans! What do you think? But more importantly, have you entered the Lulu Frost x J. Crew giveaway yet? I love you've layered everything... there's al ot of layers, but it doesn't look like you just piled everything on. It just looks effortless and so well synchronized. The pop of color in the boots and the scarf is awesome. One of my fave looks from you! Beautiful! Maybe you'd like to follow each other via BLOGLOVIN? You're so good at mixing! I feel like a broken record saying that about your style, but the mix of cozy/sparkle, masculine/feminine, high/low is quite impressive, m'dear! This look is exceptional!! Those wedge booties are awesome, I need to get on the Shoemint program! Great look! Love the layering! Perfectly styled! Wow...love the entire look. You nailed it!